Among the very earliest artifacts available for Star Trek fans to own was the book, The Making of Star Trek, by Stephen E. Whitfield and Gene Roddenberry, and I read it in the 70’s. One anecdote that I remember from that book had to do with production of the original pilot episode, “The Cage.” In one scene, the actress Susan Oliver dances as a seductive “Orion slave girl,” covered from head to foot in green body makeup. The optical lab that processed the film footage from those scenes believed they had screwed up — and they color-corrected Oliver back to her normal skin tone! As I recall the story, this happened two or three times before the studio finally sent explicit instructions to the lab and they got it right. I thought of this story when I learned from my dad a few weeks ago that someone made an unwanted “correction” to my mom’s cemetery headstone (on the proof that he saw). As long as I knew her, my mom jokingly maintained at each birthday that she was turning 29 (a source of extra hilarity when I “passed” her in age). 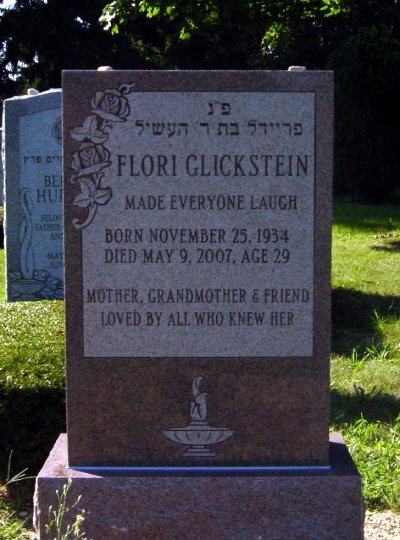 So we put it in her epitaph, since with my mom, humor was paramount. But someone saw fit to change it to 73, which is correct only in a narrow-minded arithmetical sense — pah. Fortunately we were able to correct it before production of the real headstone, which is newly erected. I was so sorry to hear about the death of your mom today. A great loss of humor will be felt on this planet. I love her head stone, and can only add that on many an occassion she and i had a conversation that she said that on her head stone it should say something about that she was getting around to it or finishing it,, what ever that was that particular month. Of course we always laughed because there were so many things that she was still finishing, or looking for, or getting around to that there was no way she would ever die. I often think about the many hours that i spent parked around the dining room table watching her do her white frosted nails for the emteenth time and we would while away the evenings laughing our guts out. I lived across the hall for almost 20 years, and I am sure that my life would have been very much empty had I not spent so much of it shuttling across the hallway.